As an organisation helping public & community services tackle social and economic deprivation, we are fully aware of the importance of the living wage (raised at the start of living wage week to £7.85ph outside of London, £9.15 inside). The minimum wage, just £6.50 per hour, leaves people with just over £11,000 a year (after tax) to pay for rent, food, clothing, heating, communication and more. A low income is soon swallowed up by paying for essentials – especially as the cost of living increases faster than the minimum wage – leaving very little to pay to allow people to find in enjoyment in life. The living wage gives that extra to allow people to live, not just survive. As a small business, with everyone working together in the same office, we see how the living wage helps employees know that they are a valued part of the OCSI team. This is certainly true of my personal experiences of benefitting from the living wage. I joined OCSI as a graduate intern in June, bright-eyed, excited and glad to be working for an organisation that has a positive impact on society. After graduating, I had used my savings to fund an unpaid internship for a charity for three months prior, which left me struggling financially, meaning I needed a job with a sustainable wage. If not for the living wage paid to interns (I have actually completed my internship now, and am a regular employee), I would not have been able to work for OCSI and would have potentially settled for something unrelated to my ambitions, at least for a time. The living wage also led me to feel valued which certainly has improved my performance. The living wage is of exceptional importance for social mobility, and business productivity – a win-win situation if you will. I could go on about the many benefits to the individuals, the businesses, and the local economy to promote the living wage, and it’s definitely worth looking at the Brighton and Hove Living Wage website which has plenty of information and advice. To finish up, I would like to stress the value of local businesses making a collective effort to pay all employees the living wage. Brighton and Hove is an exceptionally inclusive, caring and liberal city, and the living wage is symbolic of these values. Together, local businesses can help support fair pay to show how they value staff, and also inspire local businesses in other areas to follow in our footsteps. Take a look at this video made for Living Wage Week that features Living Wage employers in Brighton (including OCSI!) talk about the benefits. 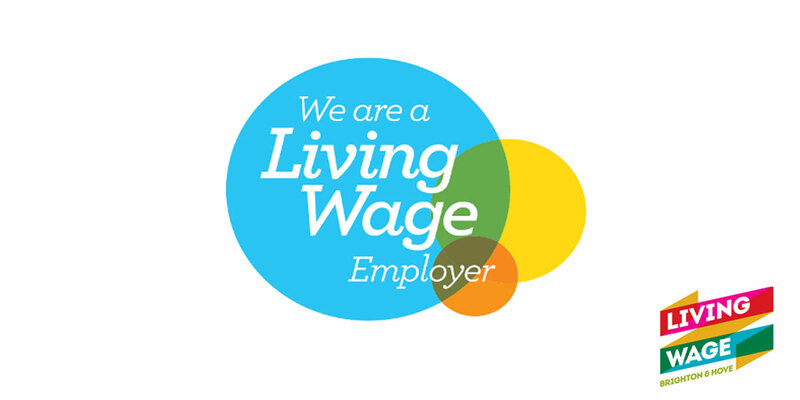 Brighton and Hove businesses can sign up through Living Wage Brighton. Businesses from elsewhere, please visit Living Wage Foundation. Come on board and register your support as a living wage employer this week.